UPDATE: Janelle has completed her studies and graduated with a degree in Music Education. Please visit our Student & Grad News & Notes page for more about Janelle, including photos of her during her music classes and playing in a co-ed mariachi band. June 2010. Janelle’s interest in music grew out of her family’s rich musical heritage. She is now in her sixth semester studying music education at the Simon Bolivar Teacher Education School. 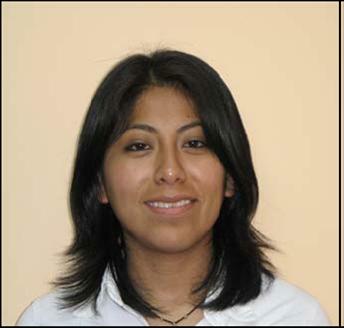 Her group took second place in the 2008 Olympiad of Music for teacher’s colleges, held in Potosí Department. She has given piano concerts, directs the children’s chorus at church, and participates in a music group for women. When Janelle finishes her coursework she will do a rural practicum. Her goal is to obtain a university degree. Janelle lives with her family of 7 in Zona Villa Pavon in the city of La Paz. Her 3 siblings are in high school, her father is a music teacher, and her mother sells musical instruments. They are all members of INELA Yearly Meeting. Janelle's studies are being sponsored in celebration of the life of Helen Fry. She has had a BQEF scholarship since 2008.